Recently, I was out for brunch with some friends, and had a very subpar vegan hash. All I could think was, I am positive I could do this better. And so, I went home and thought about it for a few days. In the end, this hash is where it is at! 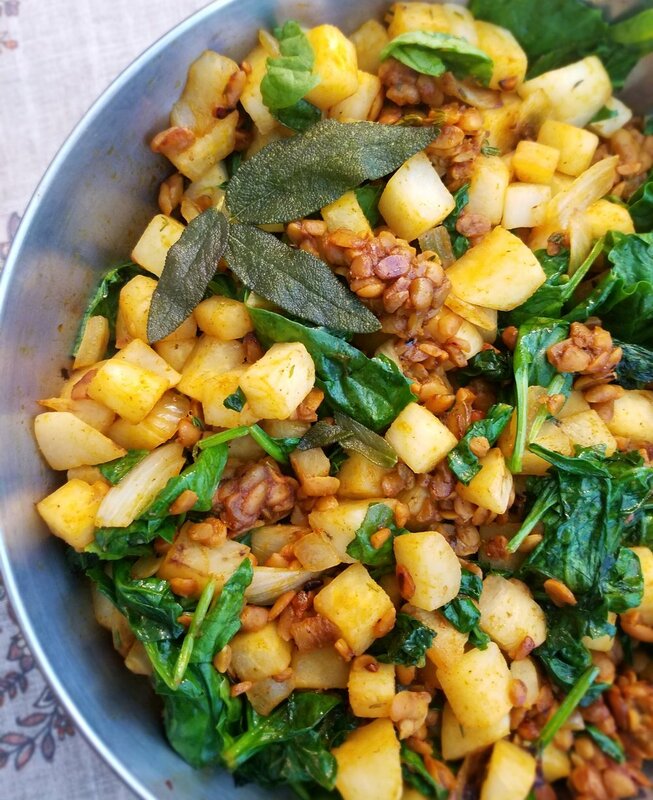 Using turnips instead of potatoes may seem unconventional, but wow, it is good. It's rustic, flavorful, and a nice change of pace from the norm. I love how well they work with fresh sage and fresh thyme, and with the hints of bacon that the tempeh gives off. It is at once new, and delicious! I used fresh herbs for this recipe, but you can substitute dried herbs, instead. Although there really is something about topping this with crisped sage that came right out of the skillet. And there is something about using fresh sage to infuse the olive oil with flavor. I still think of fresh herbs as a luxury, because they add so much! Nevertheless, if you don't have fresh herbs on hand, you can add ¼ tsp dried rubbed sage to the tempeh during the browning process, and ¼ tsp dried thyme to the turnips during the sautéing process. 1. Bring a large pot of water to a rapid boil. 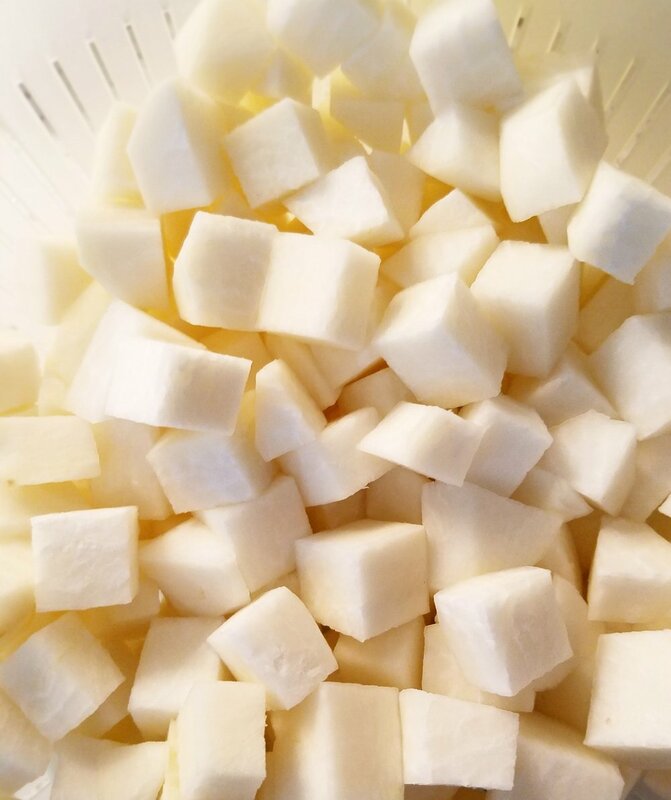 Boil turnips for 2-3 minutes. Drain and rinse. Set aside. 2. In a large mixing bowl, whisk together soy sauce, smoked paprika, hot sauce, garlic powder, nutritional yeast and maple syrup. Set aside. 3. Add 2 Tbsp olive oil and the fresh sage leaves to a large skillet. Over medium heat, crisp the sage leaves in the oil. Once the leaves are crisped, remove them from the skillet and save them to top the dish at the end. Add the tempeh to the sage infused olive oil in the skillet. Over medium heat brown the tempeh to your preferred level of crispness (I did about 10 minutes). 4. Add the browned tempeh to the soy sauce marinade and toss thoroughly. Set aside. 5. Add an additional 2 Tbsp of olive oil to the skillet, the turnips, onion, fresh thyme, a dash of salt, and some black pepper. Sauté the turnips over medium heat for 10-12 minutes or until the onions are golden and the turnips are a little browned. Stir in the spinach and tempeh, and saute another minute or until the spinach wilts. Finish with a splash of lemon juice. Serve with crisped sage on top.